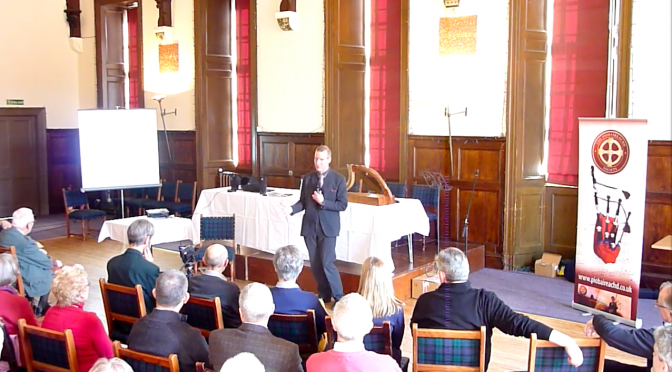 Yesterday I was at the Birnam Hotel in Dunkeld, to address the Pìobaireachd Society‘s annual conference on the subject of “clàrsach ceòl mór”. I was delighted and honoured to be asked by the Society to give this presentation on my work. On the way back from Edinburgh this afternoon we enjoyed a large detour which included a stop at the old church in Dunning. 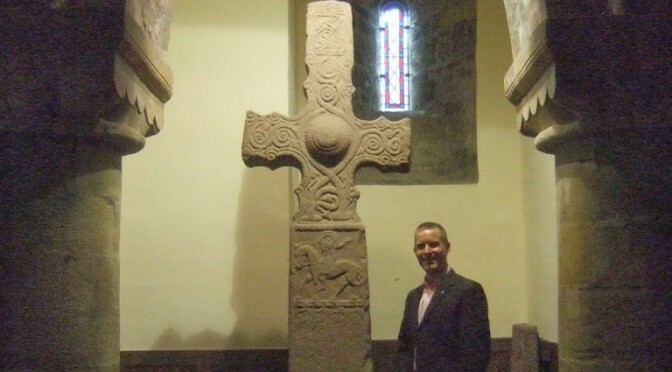 Inside this preserved medieval building in the care of Historic Scotland, is the early medieval Dupplin Cross. The cross is very well presented in the base of the tower, and is extremely well lit with raking light from above, allowing a good appreciation of the relief carving. Of course I really wanted to see the harpist, King David I suppose, but all of the carved panels were really lovely. The inscription was on the back side and was the least well illuminated so there was no possibility of reading any of it. Once everything is tidy and I am feeling less tired I will have a better look at my photographs and maybe will have somthing more to say about the David panel on the cross! 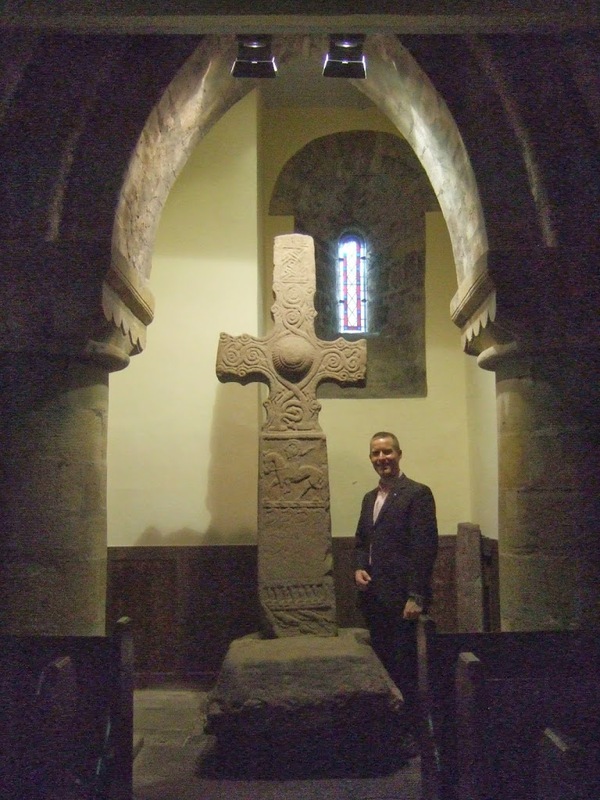 Until 1999, the cross stood on the nearby hillside, and although obviously the 1200-year-old carving and inscription is much better preserved now the cross is inside, it seems a shame that it no longer stands in situ, looking down over the ancient Pictish royal site at Forteviot. I don’t believe the original site is signposted or marked in any way – wouldn’t it be wonderful if a cast or replica could be installed there? Ronald Smith in Perth suggested I compose a tune with this title. There are ancient histories that tell how Irish monks associated with St Columba founded two monastic sites, at Rigmonadh and Bellathor. The former place name is now Kilrymont, better known as St Andrews where I live. The latter, also Kinbellachoir, is not really known but Ronald suggests it refers to modern day Perth. I have seen suggestions it is Scone – in any case somewhere in the area of Perth seems likely. For this tune I have picked up on these themes, and also on the history of a Beltane fair that Ronald tells me was celebrated in the area before the Reformation. I had hoped that my tune might come out in a form that fitted harp, fiddle and pipes. Unfortunately it twisted and turned and ended up being useless for Highland pipes, however Patrick Molard has played it on Uillean pipes and it sounds delicious! Here’s Patrick’s MP3 for you to listen to.